C-R-U-N-C-H!!! has to be one of the most satisfying sensations in your mouth. It’s like a mouth party! I’m obsessed with crunchy food. Who doesn’t love fried crunchy foods like FRIED CHICKEN and EGG ROLLS? Just today I heard about Fluffernutter spring rolls! WHAT?!?!?!?!!! The issue is flour based desserts are heavy. If I’m going to eat cake, cookies or pie, I want to eat it on its own, between meals or for afternoon tea, so I can truly appreciate it. I’m always looking for ways to make gluten free desserts that never had gluten in them in the first place. I prefer serving light desserts because I tend to cook a lot of filling food for dinner. I want my guests to walk, not crawl, home after dinner. If you want to add a satisfying crunch that’s on the lighter side and makes any friends who are gluten intolerant or just staying away from wheat, use millet puffs. 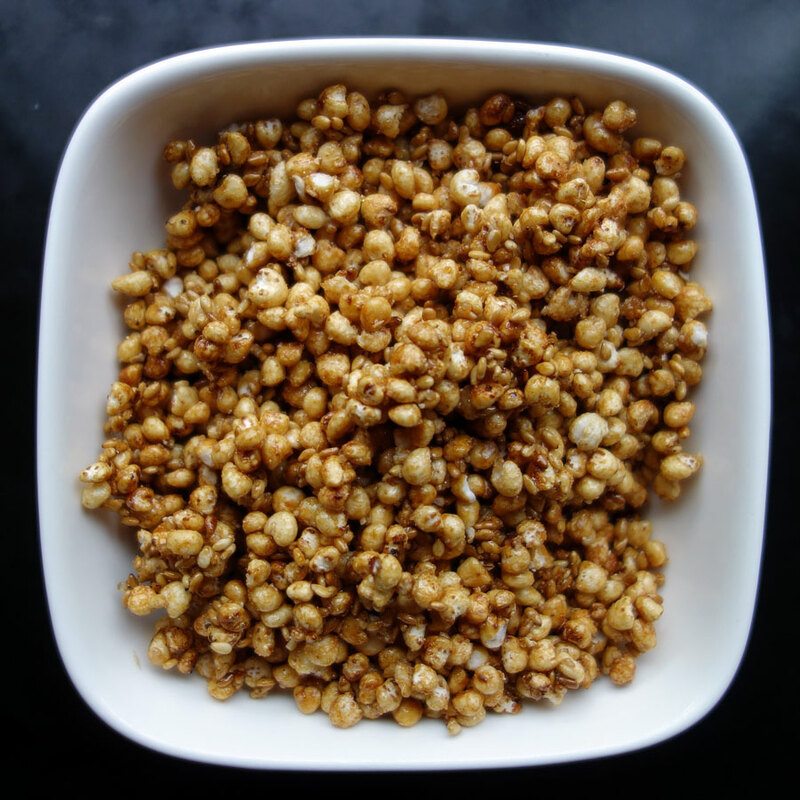 I served a banana split bar at my Oscar party and made Caramelized Millet Puffs for sprinkling. They are cute with a nice caramel sweetness and crunchy texture, perfect on top of desserts that are creamy like ice cream, puddings, semifreddo, panna cottas, etc. You can also sprinkle them on French toast, pancakes, oatmeal, granola and more. Did I mention you can simply munch on them? They taste like an upscale version of Sugar Pops from Kelloggs. I made them with sesame seeds to garnish a Ginger Panna Cotta with a Black Sesame Gelee that I friend made. My friend and slave food historian, Michael Twitty came for a visit and I gave him some leftovers to nibble on. He told me that millet is one of the foods that were brought from Africa with the slaves. It’s a crop that’s indigenous to West Africa. It’s a food from my African ancestors although they be mighty surprised to see it atop a fancy dessert. You can buy puffed millet from the health food store or Whole Foods. It’s usually found in the cereal section.